"I think I filled a void. I started making necklaces because I didn't want to shell out a few hundred dollars for costume jewelry that I don't wear everyday," said Davis. A lot of women must have felt the same way. "It seems like my pieces are real conversation starters," says Elizabeth Davis, the twentysomething creator of Spike the Punch jewelry over the telephone. Davis, who is based in Mississippi, may have no idea just how much conversation her jewelry creates. In less than one year, she has gone from a DIY hobbyist who decided to open an Etsy shop to a rockstar jewelry designer who cannot keep her fashionable baubles in stock. There was one night in September 2011 that Taylor Sterling from the Glitter Guide wrote about Spike the Punch jewelry. "Ever since then sales have been crazy," says Davis. Now that her jewelry has become so popular, she's become a veritable part of the national fashion scene and gets invited to events from New York to Los Angeles (although she's yet to attend any). It's pretty rad that Davis lives in Mississippi, a place quite removed from most fashionistas. Davis is still getting used to having a business. She says it's still really new and exciting to hear about people wearing her designs. "I don't even have a personal Facebook page, just one for Spike the Punch," she said, "Before you called I was trying to figure out what in the world this new timeline is." Davis doesn't really use social media for her personal life, but she understands how powerful of a tool it is for connecting with her customers. Her Etsy page says, "The best way to stay up to date on shop news and be informed of new and restocked pieces is to follow along on Twitter (@SpikethePunch_), where I post an announcement each time I replenish stock of popular pieces." In addition to Twitter, she loves using Instagram to communicate with customers. "I love seeing how people style my pieces on Instagram. It's such a thrill when someone tags me and I get to see where they are going and how they are styling the jewelry." Davis started using Twitter to alert her customers when she's about to post her new costume-y pieces to her Etsy page because she felt sorry for the women who were constantly refreshing Etsy all day long, waiting for new items to be posted. "I was like, 'No, we've got to think of a better way to do this,'" she said. "I'll tweet and we can set up mobile notifications, so that you won't have to look at Etsy until I have new stuff that's just about to hit." Davis works hard, sleeping only a few hours a night, to keep up with the demand for her necklaces, but they usually sell out in less than a minute. She only sells what she's made because "otherwise it would be a madhouse," she admits, "I'd be running around like a chicken with my head cut off." Considering she can't even keep her jewelry in stock, it's slightly shocking that she's kept the prices so reasonable. Most of the pieces cost less than $50, which is akin to e-commerce candy -- impulse buys at the grocery store checkout. Davis says she gets tweets all the time from people saying, "Why haven't you increased your prices?" or "Do you know anything about supply and demand?" but she's adamant about keeping her jewelry affordable. In fact, a lot of the impetus for creating Spike the Punch was that she didn't want to spend an arm and a leg on costume jewelry. So she decided to make her own. She was inspired by "this whole trend of huge chunky statement necklaces." 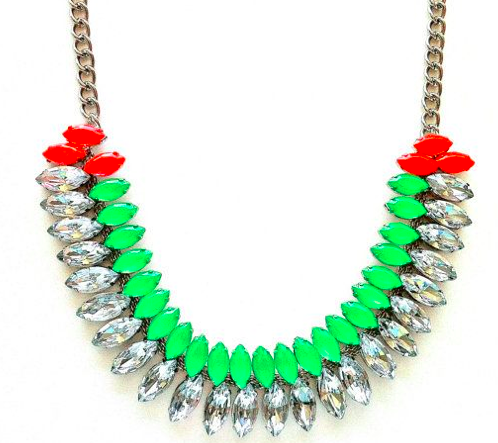 Her signature Rainey necklace is sparkly and neon. "Everybody wants to wear something sparkly and bright... or at least that's the outlook I have," says Davis, showing her luminescent personality through the telephone. Davis adamantly believes that everyone who wants her jewelry should be able to afford it. She wants her necklaces to be pieces that women can own in four different colors, if they so desire. She's kept her prices so low that she's just barely making a profit, even with all her success. "It's worth my time because I love it so much," she says, "But if this were my full time gig, I'd definitely be eating ramen noodles every night." Davis says it's great that she has a day job because it lets her keep her prices down. She doesn't have to markup her jewelry like most accessory designers tend to do. While she loves her day job, she sometimes wonders what it would have been like if she'd had this breakthrough earlier in her life and could have gone to school for design. "But I try not to dwell on it," she says. Davis is still in her 20s and all signs point towards her having a very successful career as a jewelry designer. It seems that she didn't need to go to school for fashion design, but an economics lesson on supply and demand may serve her well. I guarantee most of the women clamoring after a piece from Spike the Punch would pay at least double to join the selective, sparkly club.